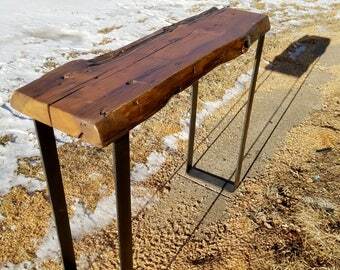 Reclaimed wood console table, sofa table, or entry table with pipe legs made from authentic, hand-hewn, salvaged wood from log cabins and barns in the upper Midwest. Compact size for a tiny home or small apartment. Choose either single or double pipe style. The feet on the legs have a spread from 6 to 10" depending on which one you choose. Please specify in the Leg Style Variations box at the top. The steel in the single pipe legs measures 1" in diameter and the double pipe legs use a more slender pipe that measures 3/4". 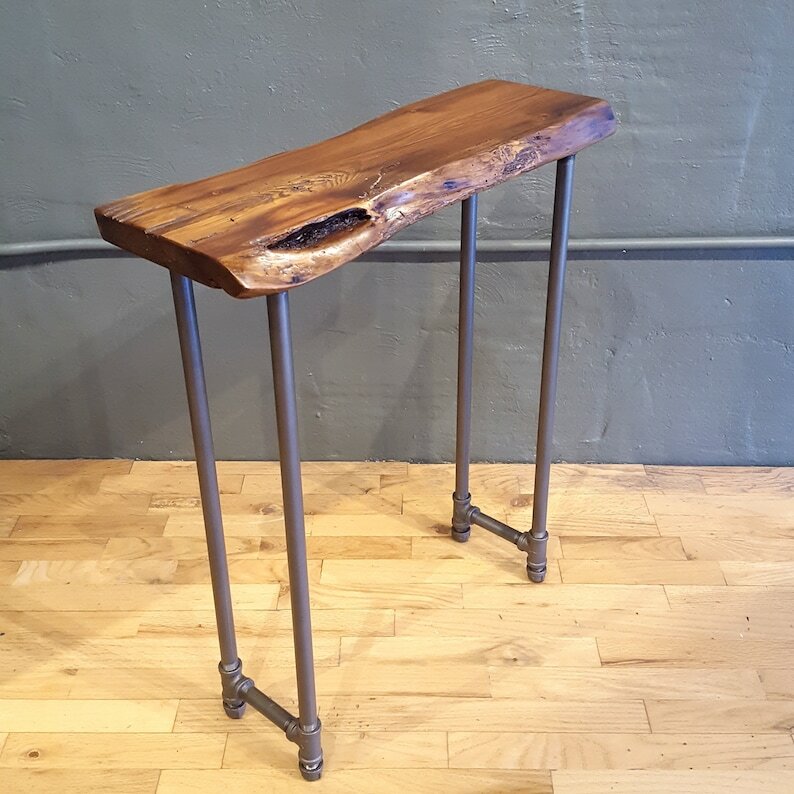 The bottom of all the pipe legs has a cap that will allow you to adjust individual leg length to accommodate uneven floors. The leg standard color is a finish called dark bronze. We also offer Black. Make a note when ordering if you would like one of these two. Arrived quickly. Very nice workmanship. Easy to put the legs on with good instructions. Perfect size and the wood has great look and color to it. Love it! Thank you. What an artist! Chris was able to create a beautiful piece that helped make sense of an awkward entryway in our house. We needed a console with very specific dimensions to accommodate our “Harry Potter” closet under the stairway. Thank you for this breathtaking piece - we will treasure it always!